The work of the late thinker, writer, literary theorist, and humanist Edward Said has left a lasting imprint on intellectual history. Said and his legacy is, to many, an inspiring and influential expression how an intellectual is, or should be, like. 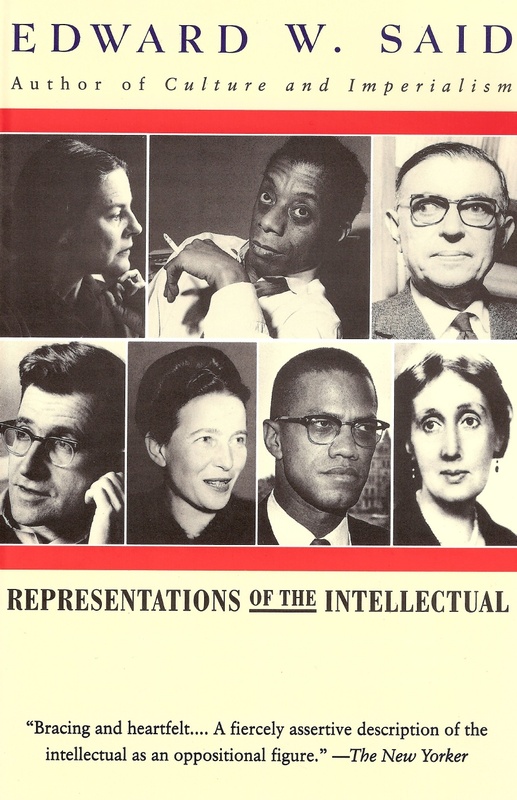 These recently reached our shores – figuratively – in the form of his 1993 Reith Lectures, titled Representations of the Intellectual (Vintage Books, 1994). Group members each took on a chapter — with a couple of chapters doubled up — to read and present at our latest session. This series of 30-minute lectures (given by “leading figures of the day”) and broadcast on BBC radio once a year, was done weekly over a period of 6 weeks. This format led Said to be “as precise, accessible and economical as possible” (p. xvi). In a similar vein, our reading group members also strove to do just this in our reflections and commentary of the written text of his lectures. They comprise Representations of the Intellectual (the title chapter), Holding Nations and Traditions at Bay, Intellectual Exile: Expatriates and Marginals, Professionals and Amateurs, Speaking Truth to Power, and Gods That Always Fail. In all of these, Said seeked to “speak about intellectuals as precisely those figures whose public performances can neither be predicted nor compelled to into some slogan, orthodox party line, or fixed dogma”, that “standards of truth about human misery and oppression were to be held” regardless of any sort of affiliation or “primeval” loyalties (p. xii). Indeed, an underlying, core theme of his lectures was — and still is — the need to speak truth to power, where necessary even against one’s own seemingly-natural allegiances. This principle resonates in milieux as diverse as views on the ongoing (as of this posting) North African-Arab uprisings (“End of ‘1989’?” Saroj Giri, OpenDemocracy, 1 March 2011), and that of a US “Realist” scholar of international relations (“Reporters, scholars, and patriots”, Stephen M. Walt, 2 March 2011), albeit in very different ways. For Said, intellectuals appeal to “as wide as possible a public, who is his or her natural constituency”, and the problem for intellectuals is the presence and enviroment that give rise to “insiders, experts, coteries, professionals” who make public opinion “conformist, encourage a reliance on a superior little band of all-knowing men in power” (p. xiii). It is interesting to also note this last point, for “they” are almost always men. Then at some point one would find oneself in a form of exile, of being in some ways marginalized. This is something that occurred to Said throughout his life, yet which supported the thesis of his lectures about the “public role of the intellectual as outsider” and “amateur” (p. x). Many of us in the group too, would have considered ourselves — to different degrees — outsiders and marginals; some perhaps more than others. It is partly because of this that we identify with Said’s thoughts and writings. The reading for the week of 6 September (2009) dealt with the international organisation and civil society reactions to the 1987 Internal Security Act (ISA) arrests in Singapore. 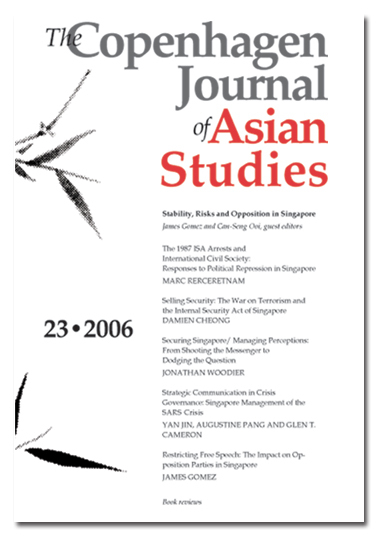 You can find the article at the Copenhagen Business School, Copenhagen Journal of Asian Studies website. The group found the piece interesting and informative, and it certainly shed some light on some of the events surrounding the Operation Spectrum arrests, which I believe is still quite obscure to most people of the post-75 generation, including most civil society activists living at the present time. Three questions, however, appeared to us, and especially to me, as we discussed this article. First, although the writer gave a fairly comprehensive overview of the organisations, informal groups and individuals involved in solidarity actions in the wake of the arrests of the so-called Marxist conspirators — post-1987, we are given precious little information or opinion regarding the abstract’s assertion, namely, how such alternative political viewpoints will continue to play a large role in shaping criticism and opposition…to the powers-that-be in the country. In fact, besides stating (in the paper) tantalising nuggets such as ‘The strong international interest shown during the 1987 ISA arrests compares markedly to other PAP crackdowns past and present’, we get to read little of how similar solidarity actions and/or alternative viewpoints (or lack thereof) will continue to shape criticism of and opposition to the PAP regime in Singapore. Second, how did these international civil society actions tie in with other international fora such as in the UN General Assembly meetings? This blogger has personally heard an account of how the Singaporean delegation to the UNGA at that time was confronted with protests and questions from at least some of his or her counterparts at the UN level. The reading group understand that this was outside of the author’s focus for his paper; however, he could have briefly touched on other types of international interactions in tandem with his emphasis on international civil society actions. Third — and this relates to the first question — where are most or any of these groups and individuals now, and how have they influenced, or helped to shape critical discourse and alternative/oppositional viewpoints, with regard to political repression in Singapore after the 1987 arrests? Again, the author of the piece could have provided readers a few clues, or pointers, or even a minimalistic projection of how they’d evolved, or even the way forward, if any. In response to this, A said something that was rather insightful. In essence: some of the info that we may have expected to be there simply wasn’t, because there is most likely a culture of self-censorship and fear — on the part of the author, the editors, the managing editors of the journal, the sources themselves. Any single one or more element in this equation is plausible. Of course, the questions we posed might just have had a simpler explanation: the info we wanted, the knowledge we seeked, was not part of the research scope of the paper, and/or the author might not have thought to include (even a passing mention of) them. I’ve taken the liberty to post one of our reading group member’s post on the topic we discussed three sessions ago. Last week, the Rowell Reading Group finally got around to discussing Cherian George’s 2005 paper on ‘internet’s political impact’. He is the author of a popular book The Airconditioned Nation and a blog by the same. The discussion on this paper has been pending for two weeks. The energy levels in the Reading group have been rather low. Some of it could be just due to the fact that we have chosen a rather busy time to meet – 5.30pm to 7pm on Sunday. T and J, the hosts are very distracted during this time as it is also a busy time for the Food03. Others have some engagement or the other to go back to in the late evening. So now we have changed the time to 3.30 to 5pm. Hopefully it will improve things. I chose this particular article because there is now a sizeable number of people in this city who believe that the internet is opening up all kinds of new political possibilities. The most recent illustration that this is indeed so is the unprecedented mobilization against the way a small group of women captured AWARE – one of a handful of civil society organizations in the city and began to rewrite the organization’s agendas. Here is a link to one of the articles in Straits Times in the run up to the massive show of solidarity by nearly 3000 people at the extraordinary general body meeting which ousted the new executive committee. The discussion meandered through “why academic writing often fails to be interesting” and “the role of the internet in recent developments in Malaysian ethnic identity politics” to “the history of the internet use in this city.” I took away one insight (thanks T, for spelling it out); and a question (thanks R for prompting me to ask); and a bunch of notes (thanks S for jotting down). The insight is that, in a situation where it appears that nothing about the way people think and act seems to be changing, changes in technology can actually be a source of great optimism. Simply by making people do things differently, communicate and connect differently, social media is bringing about a lot of change silently. To put it succinctly, social media is the space where people are rehearsing participation. If the way, every now and then large numbers of people are prompted, mobilized enough to act in concert off the internet too, it is reasonable to expect that as technological change deepens, we will begin to see its consequences in political practice. The question is: mobilizations in this city that seem to start on the internet and fall out into the real world, are at least until now merely one off events. This is because the social media through which these mobilizations happen also imply a lot of distractions. Is there any way at all to influence how things happen or are internet mobilizations like those inexplicable natural phenomena – where somehow a random event somewhere starts a chain of responses that are entirely unpredictable? And today, I received this message from a mailing list for an event that i cannot attend would have loved to. Speakers at the Social Media for Mobilization panel discussion in Bangalore’s Center for Internet and Society will be addressing similar questions, I hope. Rowell Reading Group meets every Sunday from 5.00pm to 7.00 pm at 109, Rowell Road, Little India, Singapore.